One of the only drawbacks of practicing medicine and blogging is that these are mostly sedentary activities. We all know about the pitfalls of a sedentary lifestyle, which can contribute to weight gain, heart disease, osteoporosis, and insomnia, just to name a few. It is less commonly known that being sedentary can contribute to reproductive complaints. Lack of exercise can contribute to menstrual cramps, especially those that include stabbing pains. Exercise can also help prevent prostate issues. The common factor between these two issues is circulation. When we walk a lot, we have good blood flow through the pelvis. When we spend our days sitting still, there can be inadequate blood flow to the pelvis. Then the reproductive organs don’t get the nutrients that they need, and waste products are removed efficiently. With these impediments, our organs cannot function properly and can cause us short-term or long-term distress. In addition to keeping out bodies moving, we can help prevent and ease these reproductive complaints by using herbs that improve circulation. There are two main categories of herbs for circulation: those that dilate blood vessels and those that cause movement of lymphatic fluids. This second category of herbs stimulates the lymphatic system, which is responsible for helping carry waste away from our cells. If the lymphatic system isn’t working well, fluid can build up in an area and contribute to discomfort. Examples of lymphatic herbs are burdock, calendula, red root, and ocotillo. Any of these herbs can be a valuable addition to a treatment plan for either prostate issues or menstrual discomfort. 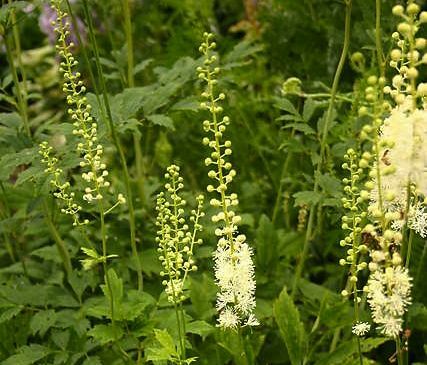 Black cohosh is an herb that is traditionally used for menstrual cramps as well as a wide array of menopausal complaints. It is also as useful for prostate issues especially if there is dull achy pain in the pelvis. Black cohosh can ease these pelvic complaints because it improves circulation by dilating blood vessels. Black cohosh also helps reduce muscle spasms further enhancing its usefulness in this area. This entry was posted in Health and tagged benign prostate hyperplasia, menstrual cramps, prostate. Bookmark the permalink.